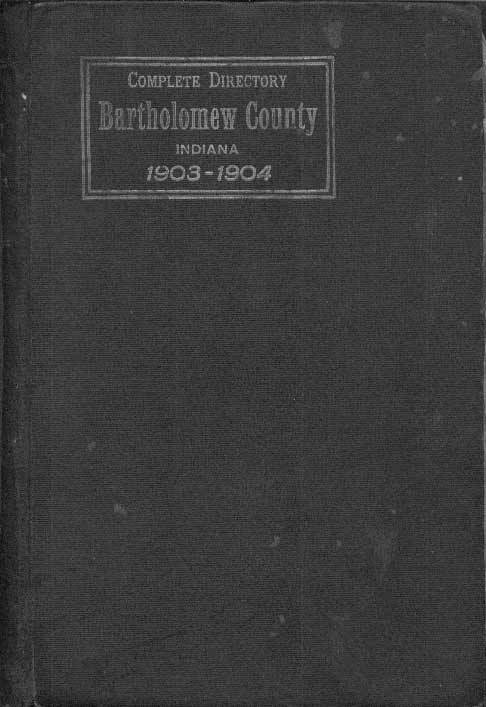 In 1904, the Bartholomew County Directory Co., headed by George Pence, had published the Complete Directory, Bartholomew County Indiana, 1903-1904, which included the city of Columbus Indiana. This publication was unique because of the "Pictorial Department," a pictographic record of over 1,488 Bartholomew County people. "Of the pictures of 1,488 Bartholomew County people contained in this work, a special effort was made to procure the pictures of the veterans of the wars of 1812, and of Mexico. Twenty faces of soldiers of the war with Great Britain, and thirty-two of the war with Mexico, are here preserved. Beside, with good fortune, the picture of Captain Francis Lytle, a Color-bearer in a Pennsylvania Regiment in the War of the Revolution, was procured in the State of Iowa, and is included." The disappointing part of this Historic Columbus Indiana website offering is the fact that, some of the pages in the pictorial section are missing, and other pages have photos clipped. I am asking anyone who has a copy of this book, if they could please email me the missing pages (scanned at 200 dpi), it would be very helpful in providing the complete section. Use This Searchbox To Search For Names From The Directory! Simply click on the image below to go to the next page. If you want to go back to a preceding page, use the back-button on your internet browser.